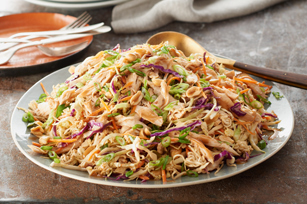 This fabulous-looking Asian Chicken Noodle Salad is easy to make, thanks to a ramen noodle soup mix, a coleslaw blend and a spoonful of peanut butter. Break Noodles into small pieces in large bowl. Add coleslaw blend, chicken, onions and nuts; mix lightly. Discard Seasoning Packet from soup mix or reserve for another use. Beat dressing and peanut butter with whisk until blended. Add to salad; toss to coat. Add 1/2 tsp. Sriracha sauce to dressing mixture before tossing with salad.